Once home from travels to historic sites and architectural wonders, we struggle to capture and retain the color, light, texture and line, mood and emotion aroused by our experiences. We patch together photo books and scribble travelogues to fix in our minds breathtaking panoramas, stunning vistas, or holy sites. But painter Steve Joy does so much more with the sensations he gathers from international travel. 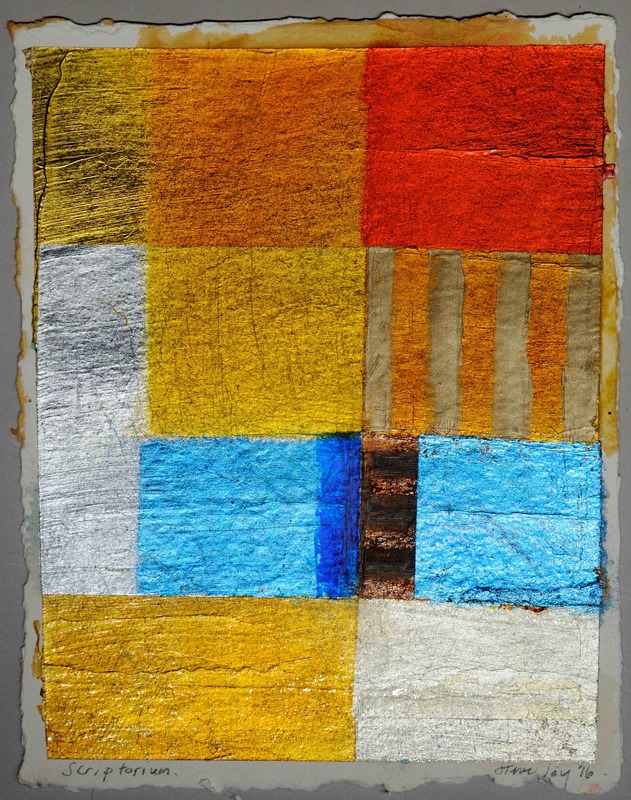 A yearlong effort resulting in thirty works, Steve Joy: Icons Abbeys Elizabethans: Paper Works, will be on display through July 2 at Gallery 72. These abstract expressions of geometry, texture and color seem to channel the spiritual inspiration Joy found in the silence of 12th century French abbeys. More than half the paintings in the show focus on four Cistercian abbeys, founded in 1098 by a group of Benedictine Monks around Citeaux, France, close to Dijon. The overriding characteristic of these abbeys is an austere architecture, spare on decoration, but long on silence. Joy uses the Abbey of Fontenay, a Romanesque/Gothic structure near Montbard, as the subject of eleven paintings, some in a series entitled, “Architecture of Silence.” Other French abbeys: Noirlac, Le Thoronet, and Loc Dieu inspired additional works in the show. It is well worth visiting images of the abbey online for an aha moment. One can clearly see the connection between Joy’s works and these venerable settings, their interiors in some spaces dimly lit, in other spots filled with morning light filtering through pale stained glass windows. Joy seems to capture the aura of these settings with patinas reminiscent of medieval icons that reflect the influence he attributes to early Renaissance painters Giotto and Duccio. His surfaces often begin with a layer of fiberglass strings, or crinkled papers. Geometric shapes painted with ochres, pink champagnes, glassy grays and gold leaf create the next surface. The layering of paper, paint and sheens provide a depth and fluidity that contradicts his hard-edged shapes. By using varnishes of beeswax and oil, both developed from ancient techniques, Joy accomplishes an effect that makes the painting feel centuries old. How did Joy develop a style combining abstract expressionism with painting techniques associated with 15th century European painters? His journey has had dual focuses: spiritual and artistic, but the path has been unconventional. Born in Plymouth, England, in 1952, Joy joined the Royal Air Force at age 16. Like many young people who broaden their horizons through military service, so, too, did Joy. He flew supply planes around the world and found himself on the Maldives Islands with lots of time to read and think. He read about Paul Cezanne and later studied comparative religions at the Royal Air Force’s College for Chaplains. In 1973, at age 24, on an outing with friends, he waited out a rainstorm in the Stedejlik Museum in Amsterdam. There he had an artistic conversion when exposed to the paintings of Barnett Newman, an American abstract expressionist. From 1979 Joy pursued formal art training at Cardiff College in Wales and Exeter, completing his MFA at Chelsea College of Art in London in 1981. In his talk at Gallery 72, he said he had a “quick career” showing his work in London, then soon after accepting a teaching position in Oslo, Norway, but something didn’t feel right. “I just seemed to be making art for the art world,” Joy said. This is when things became much more unconventional. So he packed up and moved to a deconsecrated chapel in Umbria. For many years following, as if on a pilgrimage, he moved to other locales where great artists had lived and painted. Joy said rather than view art movements from the Renaissance forward, his approach was to look backwards from the Renaissance to medieval and Byzantine periods. Joy sees his life as a spiritual journey. In his travels he has spent time in a Buddhist retreat in Thailand as well as Mayan temples. He has lived in monasteries, abbeys and castles, near-ruined churches and cemeteries and, for a time, in Japan learning about its many ancient rituals. Joy’s peripatetic life has brought him to Omaha, a sort of home-base. In 1998 he became a curator at the Bemis Center for Contemporary Arts. While he has continued to travel, he maintains a studio in downtown Omaha. In 2008, Joslyn Art Museum hosted a show, Uncreated Light: Steve Joy Paintings, 1980-2008, a mid-life retrospective. Since 2009 he continues to anchor his life in Omaha while travelling the world. He exhibits work in galleries throughout the U.S. and Europe; his work can be found regionally at the Keichel Fine Art Gallery in Lincoln and Gallery 72 in Omaha. So, without a photo book, without a travelogue, without a video, in fact, without any representational image, Steve Joy, takes you there.